A superb newly refurbished 116 sq m/1, 254 sq ft three bedroom apartment situated on sought-after Lancaster Terrace. The property comprises a bright reception room, fitted kitchen, master bedroom with en-suite shower room, second bedroom with en-suite shower room, third bedroom/study, further bathroom and ample storage place. 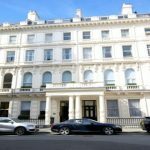 This exclusive property is ideally located close to Hyde Park and offers excellent transport links: Paddington Station (Hammersmith&City, Bakerloo, District and Circle lines, National Rail) and Lancaster Gate Station (Central Line) are close by.